Task Fronterra can provide a range of core goniometry services from oriented and unoriented core, as well as from pre-scanned and CT scanned whole core images. Detailed structural and sedimentological information acquired from the core can be captured, digitised, correctly oriented and depth referenced. 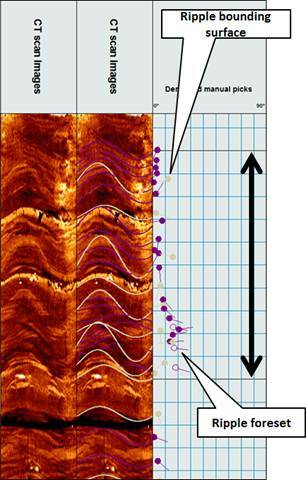 Comparisons against any available dipmeter, image log or petrophysical log data can be made. Core oriented by scribes during drilling. Core oriented by reference to associated borehole image. Features on core sampled by manual sleeve technique or by whole core exterior digitally scanned images. Core cleaned, laid out and re-fitted. Consistent fitted core intervals detailed on spreadsheets. Rubble zones investigated. Whole core exterior digitally scanned in colour using short core lengths. Coherent sets of core images stitched. Data entered as digital image. Image data depth-matched to open hole logs. For scribed core data, the well orientation and scribe data are imported and used to orientate. For un-scribed core, data linked to borehole image and spun to match previously picked borehole image features. Data sets checked for quality. Goniometry images dip picked as a borehole image. Such images often allow very detailed picking down to the scale of ripple sets, use an appropriate dip picking scheme. Following dip picking, the usual structural and sedimentological analyses can be completed. Goniometry images presented at a range of scales with superimposed manually picked sine waves along with tadpole and azimuth plots. Dip data presented after correction of structural tilt. Data and results associated with analysis presented.